, a learned German writer, and one of the most arrogant and contentious critics of his time, was born about 1576; and studied first at Amberg, then at Heidelberg, afterwards at Altdorf, at the charges of the elector palatine. Having made a considerable stay at Ingolstadt, he returned to Altdorff, where he began to publish some of his works. 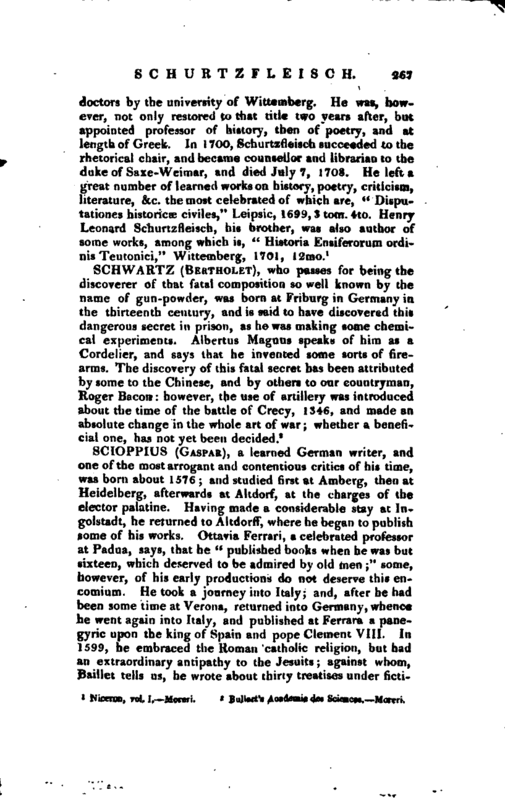 Ottavia Ferrari, a celebrated professor at Padua, says, that he “published books when he was but sixteen, which deserved to be admired by old men;” some, however, of his early productions do not deserve this encomium. He took a journey into Italy; and, after he had been some time at Verona, returned into Germany, whence he went again into Italy, and published at Ferrara a panegyric upon the king of Spain and pope Clement VIII. 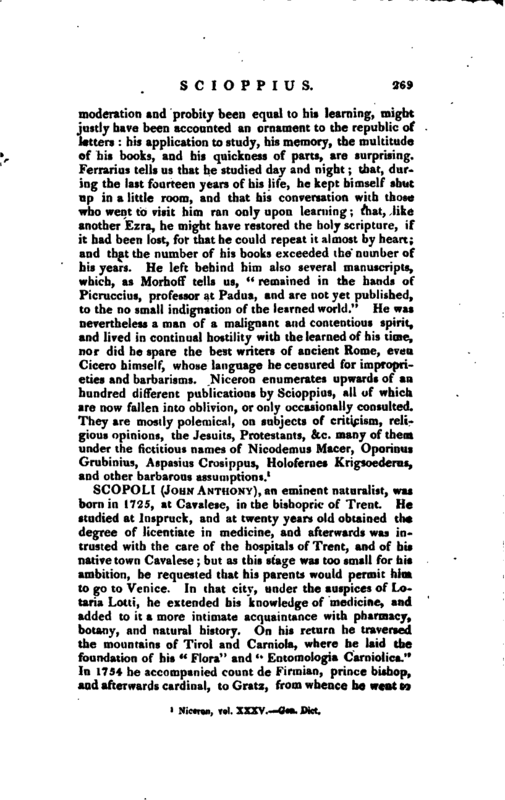 Iti 1599, he embraced the Roman catholic religion, but had an extraordinary antipathy to the Jesuits; against whom, Baillet tells us, he wrote about thirty treatises under | fictitious names. Nor was he more lenient to the Protestants, and solicited the princes to extirpate them by the most bloody means, in a book which he published at Pavia in 1619, under the title of “Gasp. Scioppii Consiliarii Regii Classieum belli sa’cri, sive, Heldus Redivivus.” The following is the title of another, printed at Mentz in 1612, against Philip Mornay du Plessis; and which, as he tells us in the title-page, he sent to James I. of England, by way of new-year’s gift: “Alexipharmacum Regium felli clraconum et veneno aspidum sub Philippi Mornaei de Piessis nuper Papatus historia abdito appositum, et sereniss. Jacobo Magnae Britanniae Regi strenae Januariae loco muneri missum.” He had before attacked the king of England, by publishing in 1611, two books with these titles; “Ec­clesiasticus auctoritati Sereniss. D. Jacob), &c. oppositus,” and “Collyrium Regium Britanniae Regi graviter ex oculis laboranti muneri missum;” that is, “An Eye-salve for the use of his Britannic majesty.” In the first of these pieces he ventured to attack Henry IV. of France in a most violent manner which occasioned his book to be burnt at Paris. He gloried, however, in this disgrace and, according to his own account, had the farther honour of being hanged in effigy in a farce, which was acted before the king of England. He did not, however, always escape with impunity; for, in 1614, the servants of the English ambassador are said to have beaten him with great severity at Madrid. Of the wounds he received in this conflict, he, as usual, made his boasts, as he also did of having been the principal contriver of the Catholic league, which proved so ruinous to the Protestants in Germany. 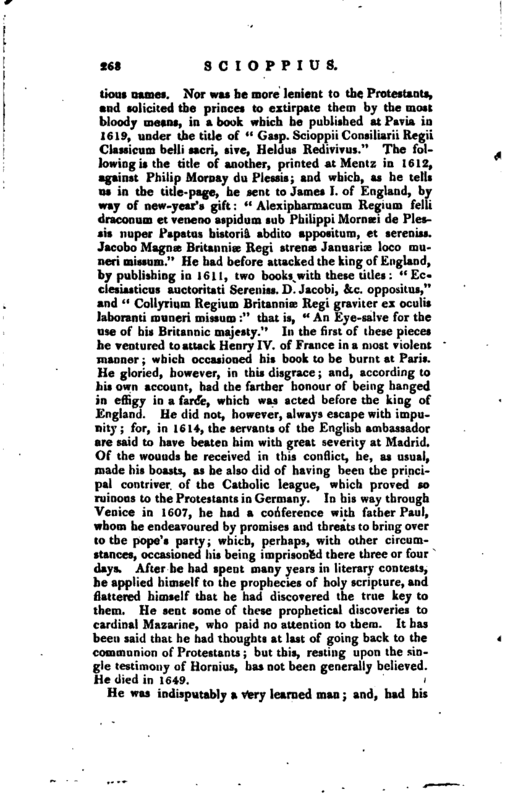 In his way through Venice in 1607, he had a conference with father Paul, whom he endeavoured by promises and threats to bring over to the pope’s party; which, perhaps, with other circumstances, occasioned his being imprisoned there three or four days. After he had spent many years in literary contests, he applied himself to the prophecies of holy scripture, and flattered himself that he had discovered the true key to them. He sent some of these prophetical discoveries to -cardinal Mazarine, who paid no attention to them. It has been said that he had thoughts at last of going back to the communion of Protestants; but this, resting upon the single testimony of Hornius, has not been generally believed. He died in 1649. Niceron, vol. XXXV, Gen. Dict.